First of all, I think the gameplay and graphics are looking fantastic. I really enjoy how the game looks with it enormous amount colours and such. But as much as I like it, it also ruines the part of the game. The amount of colours around the entire city can really disturb the gameplay. Players maybe cant focus on the objective or find a better route because of that. Reducing the colours and making it fit into a better style instead of putting random type of colours everywhere will increase the chance of players not getting disturbed, and can better focus on the game. You may add your opinions, thoughts or ideas. But please in more mature and understanding way. I don't think the colors will effect my ability to focus during gameplay but we should be able to tell if it's a problem during early access. LocationGermany. The north of it. Somewhere there. Same here. Bright colors are a big part of the game. This decade has more than enough desaturated games. If anything, i want MORE effects/blur/lensflares! Dis forum be ded, yo! Also igns are anything with Xan in the name. JSRF art style is the best i have ever seen. 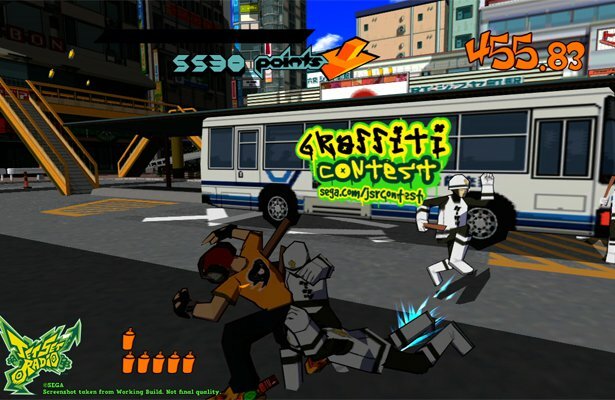 I will be honest that hovers does look really awesome, but doesn't hit that nostalgic spot JSRF still does. I would personally love to see some texture mods or DLC textures. or even making your own colors that be awesome. I love the way it looks now and don't think it should be toned down. Don't worry Cirax, it will hit that nostalgic spot ten year down the line. That's how nostalgia works.